Sure thing. I can just put two short clips (say 5 seconds each) into a timeline and give that project a new filename. Will that do the trick? Be sure to work on a different clips, where are trying to figure out if it's a corrupted media, also take note if it asked you for the destination folder. Thanks! Will do. It's midnight here in the UK now, so I'll shoot two new clips tomorrow and let you know the outcome. The thanks are all mine. I loaded two new .movs (shot on an iPhone and uploaded to my c: drive) and put them into a new project. Selected File - Publish to ... - Local Drive and got the same error message as before. It didn't ask me to specify a destination. Can you delete the following file? Done. Shall I try again now? Go ahead and publish? By the way did you tried to uninstall and reinstall? Are there any other harddrive USB drive connected? Didn't work, I'm afraid. I closed down the app and re-launched it after deleting the files you mentioned. Then I created a new project with two clips and tried to publish it but got the same error as before. I did uninstall and re-install shortly before I first posted to this thread. Also, yesterday the Application Manager invited me to install version 2018.7 (it spoke of "bug fixes", so I liked the sound of that ...) but however often I try to do that it won't install - it just keeps telling me I need to install, but it won't let me do so. I think what I might do now is to uninstall again and load 2018.7 from scratch, see if that makes any difference. I do have an external USB HDD attached sometimes, yes. But in this instance the media files I'm using are on the C drive. We found an issue with the MC2018.7 installer, I recommend you unistall 2018.5 then install 2018.7, you can get the download via Avid master account. Ralph, I sincerely thank you for your efforts so far but I think I'm going to give up. 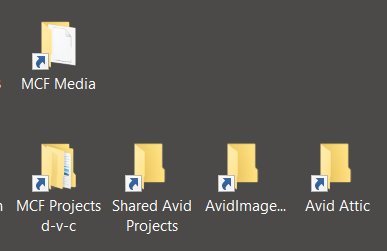 There's clearly something about my computer set-up that doesn't agree with the Avid software, so I think I'm just going to have to try a different program. It's a shame, because I work in Avid all the time in my professional capacity, but at the moment it's taking all my personal time just trying to get the app to run on my own equipment, and I think it'll be quicker to just learn a different system. All versions until 2018.9 have worked perfectly. Now I join some of the rest of you. Clue: I did a mixdown of a LINKED file and it worked fine. And, the published SEQUENCE is also fine despite the publishing error. So the error comes after the Sequence file has been created. I did do one thing before installing 18.9 -- I emptied all these folders. I'm afraid I just gave up eventually. I dare say it's my own fault in some way, but I just couldn't get the Avid software to run, so I've gone elsewhere. Media Composer then re-creates (the default) settings when you open up the software. You do not have to give up on using MCF. 3) The two or three files will be in yourAvidMedia folder. 4) Drop them into another NLE. I use Resolve. 5) Export your movie as DNxHD or ProRes.